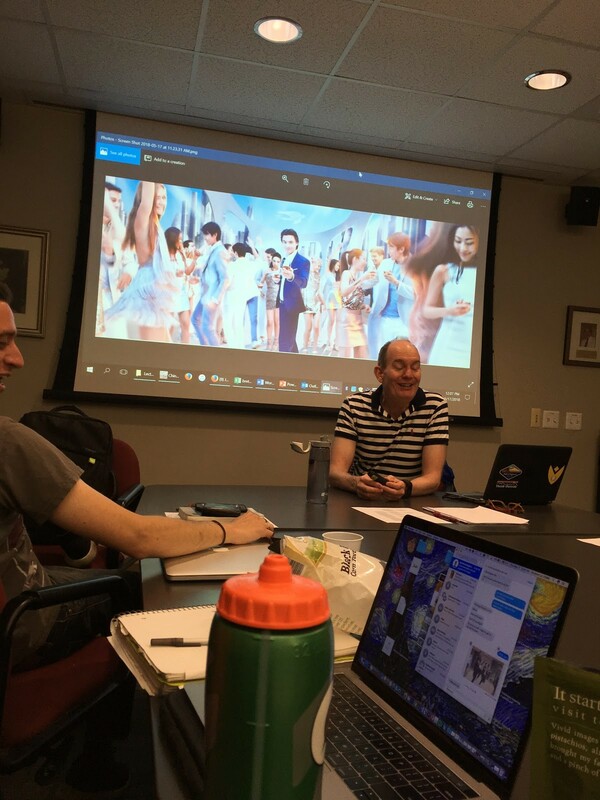 Today during lecture, Professor Sheehan talked about the global connections forged from 1850 to 1925. After the Age of Exploration came the colonization of African and Asian countries by Europeans. Manufactured goods were exported from Europe, and trade in precious metals, slaves, drugs, and food-drugs was facilitated by globalization. The Gold Standard also helped standardize currency conversions, but excluded India and China from the world trading system because they used silver. In addition to trade, global connections were also forged through wars such as the First and Second World War and the mutiny in Bengal India. Technologies also helped improved the way people communicated and traveled. For example, the Steam Engine allowed for people to travel faster by steamship or railroad, and the building of the Transatlantic Cable revolutionized the way people communicated. The results of this global connection was felt when the Great Depression destroyed the gold standard. Previously, an economic recession may only affect the country it takes place in, but due to this interconnectedness, the Depression affected many countries outside America, causing for protectionism to increase and for the world to divide into competitive economic blocs. After some lecturing, we started our class discussion on the first readings in our main course text, Consumption in China by Lianne Yu. Much of our discussion centered around consumer habits of “Singletons,” generations of Chinese people who were born during the One-Child Policy and grew up in the economic reform period. The “Singletons” are socially unique as all of their family’s resources are focused solely on them. Our discussion continued to elaborate on the marketing implications for these generations of Singletons. Another major point of discussion was Yu’s commentary on the role of the Chinese government in the supply demand relationships of China’s increasingly Capitalist economic model. The CCP has released some control but not too much. Our class discussion lead to remarks on government censorship in China, exploring why and how it’s implemented. We then had time with our groups to develop our project ideas and find a picture for our papers due Monday. 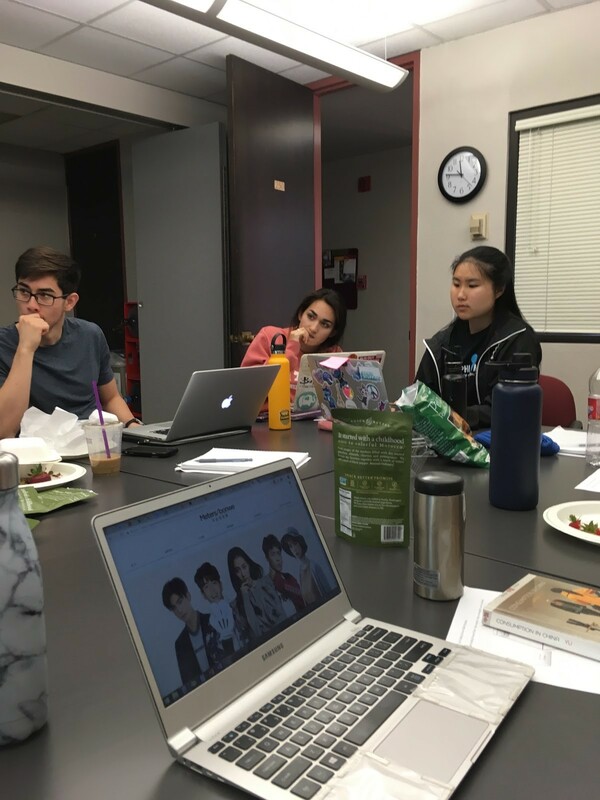 Some of the group project topics are athletic footwear, coffee shops, Chinese medicine, alcohol advertisements, and Meter/Bonwe- a Chinese store that positions their brand as Western. Regarding the development of our research project, we decided to narrow down our research topic from simply Fashion to street wear sold by a Chinese clothing company called Meters/Bonwe. We are interested in investigating how they market themselves as a foreign company through analyzing their advertisements, the design of their clothing, and the layout of their stores when we arrive in China. Fortunately, we were able to locate at least one Meter/Bonwe store in each city in China that we will be traveling to, so we will also be able to identify the types of customers that shop in Meters/Bonwe stores. Through analyzing the way they advertise themselves as a foreign company, we hope to draw conclusions about the impact of globalization in China as well as what the ads reflect about China’s consumer culture. 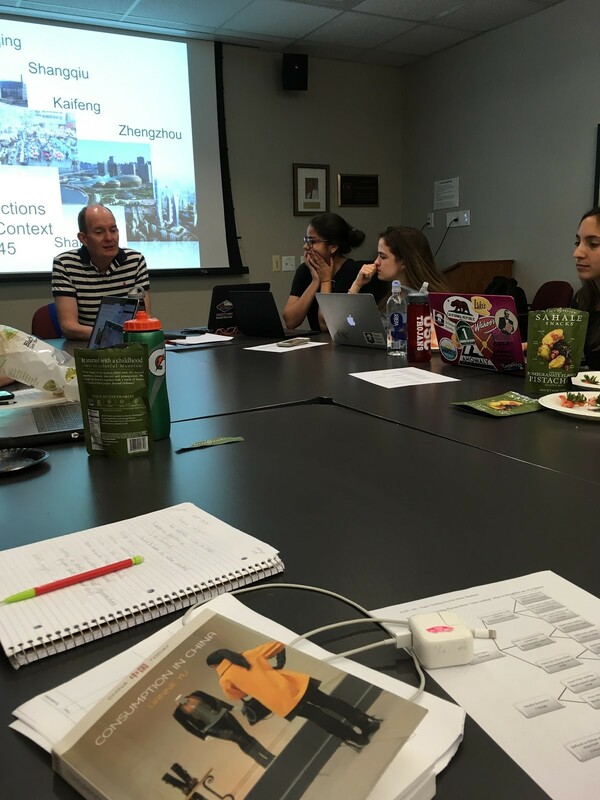 Last but not least, Professor Sheehan shared stories with the class about mishaps in past Global East Asia trips. He advised us to be weary of people wanting to “practice their English” with you, they may take you to a tea house and a bar and you could be left with a hefty bill. Follow the golden rule: don’t do anything to freak out Professor Sheehan and be conscious of ‘expat bubbles’ in China. This entry was posted in Uncategorized by geachina. Bookmark the permalink.